Many of us enjoy the freedom provided by having a car at our disposal for the duration of our overseas holiday. The first thing to consider is the feasibility of taking your own car with you. Check with your car insurance provider that you will be covered whilst overseas and for how long. Where this is not practical, big savings and a wider choice of car can be made if you pre-book your car hire. Spend time visiting various websites and definitely avoid hiring your car at the destination airport. Travelsupermarket.com, avis.co.uk, kayak and carrentals.co.uk all have their strengths and should give you a broad enough spread to provide what you want. Travelsupermarket.com will probably find you the best price but their website is not the easiest to navigate. 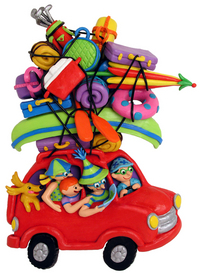 Some countries insist on certain items drivers should have in their car. These include warning triangles, reflective jackets and an unused breathalyser. Check what is required for the countries that you are visiting and, if hiring, check that these items are included with the vehicle. Some countries require a vignette to travel on their motorways. Other items that are sensible to include are an up-to-date map and sat-nav download, change for toll booths and anything else that you would take on a long journey at home.